Tensions in the European Balkans are soaring again over the goal celebrations of two Swiss attackers during the match Switzerland – Serbia. Swiss star strikers Granit Xhaka and Xherdan Shaqiri both scored for Switzerland who beat Serbia 2-1 after a dramatic comeback. 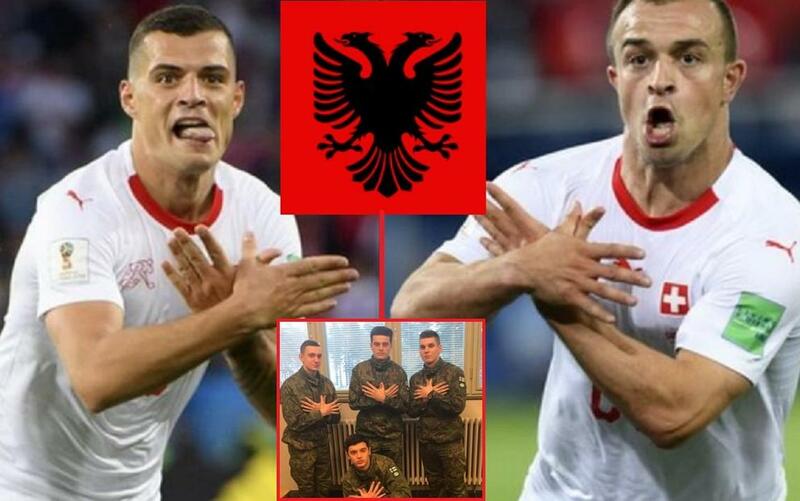 However, Xhaka and Shaqiri, who are both of Albanian descent, made a ‘double eagle’ gesture, referring to the double headed eagle on the Albanian flag and to the Yugoslav war of the 1990s when Serbians drove out their families from their homeland and made them flee to Switzerland. Young Xhaka and Shaqiri saw their respective fathers imprisoned in Serbia whilst both young men developed into fine footballers over in safe Switzerland. They never forgot their heritage apparently and matchday was some sort of payback as they repeated the gesture in front of Serbian supporters after the final whistle again. "Furthermore, a preliminary investigation has been opened against the coach of the Serbian national team, Mladen Krstajic, for alleged statements made in the aftermath of the said match." When asked about the political celebrations, Shaqiri said to the Swiss press: "It's just emotion." "I'm very happy to score this goal. It's not more. I think we don't have to speak about this now." Serbs resisted their muslim oppressors, and the fake media demonized them for it. The mongoloid Swiss/Albanians soccer dweebs need to be banished back to Albania.